Residential wood combustion is the main source of elevated concentrations of fine particulate matter (PM2.5) during winter in many towns of Tasmania, Australia. A commercially available firebox catalyst in Australia has previously been shown to reduce visible smoke emissions and the manufacturer reports reductions in particle emissions generated from individual wood heaters in laboratory settings. 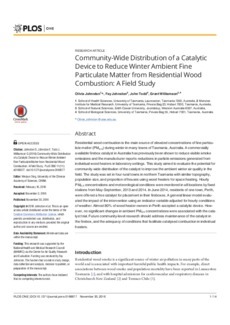 This study aimed to evaluate the potential for community-wide distribution of the catalyst to improve the ambient winter air quality in the field. The study was set in four rural towns in northern Tasmania with similar topography, population size, and proportion of houses using wood heaters for space heating. Hourly PM2.5 concentrations and meteorological conditions were monitored in all locations by fixed stations from May-September, 2013 and 2014. In June 2014, residents of one town, Perth, were offered a free catalyst for placement in their fireboxes. A general linear model evaluated the impact of the intervention using an indicator variable adjusted for hourly conditions of weather. Almost 80% of wood heater owners in Perth accepted a catalytic device. However, no significant changes in ambient PM2.5 concentrations were associated with the catalyst trial. Future community-level research should address maintenance of the catalyst in the firebox, and the adequacy of conditions that facilitate catalysed combustion in individual heaters.